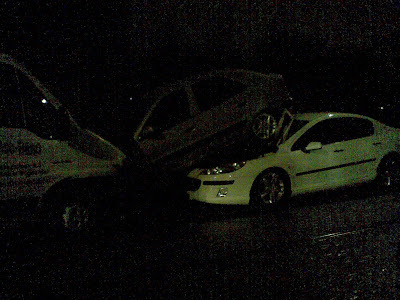 This was taken in Sint-Agatha-Berchem on monday 22 feb 2010 at about 21:35. If someone know what happened, please explain in the comments. I cant figure out an explanation, as these cars are on the parking lane! What about this: the van absolutely wanted to park there and pushed the car in front of it onto the other car... ? ?